This artist's concept depicts the Bigelow Expandable Activity Module (BEAM), constructed by Bigelow Aerospace, attached to the International Space Station (ISS). The BEAM will be launched to the space station later this year. Habitat will be attached to the International Space Station to test durability in the extremes of space. Bill Condie reports. The first expandable space habitat, that could one day be used as a sort of tent to house humans on Mars, will be installed this weekend on the International Space Station. 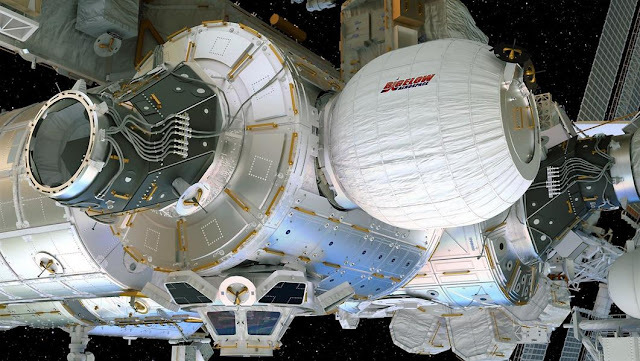 The Bigelow Expandable Activity Module (BEAM) will be attached to the station’s Tranquility module in an operation expected to take about four hours. The habitat was delivered to the ISS on board SpaceX’s Dragon spacecraft earlier this week. NASA has been interested in expandable habitats since the 1960s. They are attractive because they are designed to take up less room on a rocket, but provide greater volume for living and working in space once expanded. When packed to be transported, the BEAM habitat is 1.7 metres long and around 2.4 metres in diameter. When inflated to its pressurised dimensions it is 4.0 metres long and 3.2 metres in diameter. It weighs around 1,360 kilograms. The windowless habitat has two metal bulkheads, with an aluminium frame and multiple layers of Kevlar-like fabric and closed-cell vinyl polymer foam with spacing between the layers, that protect an internal "bladder". The tests over two years on the ISS will give engineers an idea of how well the habitat protects against solar radiation, space debris and the temperature extremes of space. While astronauts will not spend long periods in the habitat during the test period, they will first enter the habitat about a week after expansion and return for a few hours several times a year to retrieve sensor data and assess conditions. Once the test period is over, BEAM will be released from the space station, and will burn up during its descent through Earth’s atmosphere. For coverage times and to watch the BEAM installation live, visit NASA TV. Bigelow plans to build a second BEAM module for use as an airlock on its Bigelow Commercial Space Station that the company currently has under development.